This is a better "No-Poo" method than Baking Soda. Much gentler, more cleansing and totally biodegradable. 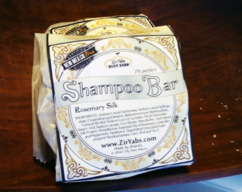 It is an all plant, all natural shampoo combination containing no chemicals or synthetic detergents for the ultimate in gentle plant based shampoo. 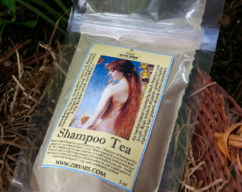 I've only added natural hair cleansing and hair healthy plants to this shampoo tea. 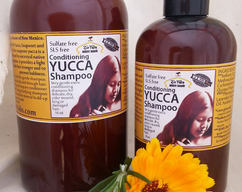 Organic Yucca is THE hair cleanser for traditional Navajo peoples and it is said to cleanse hair and encourage hair growth. It is also used to help prevent hair fall or loss. It may work by helping the scalp remain healthy because it works as an anti-inflammatory. Organic Soapwort in a gentle cleansing plant that grows in North America as well as Europe. It is a natural plant that lathers, cleanses and provides a mild antifungal. It is said that soapwort was used to wash the shroud of Turin it is that gentle yet still cleansing. 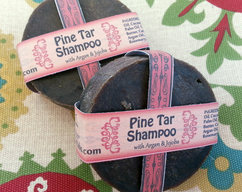 It is used for thinning hair and itchy scalp. It does not strip hair. Shikakai or "Hair Fruit" is a fruit rich in vitamins and antioxidants that has been used for centuries to promote hair growth. It's cooling properties sooths inflamation and provides good Ph for hair and scalp. gentle antifungal properties discourages dandruff, dryness and itchiness. It helps make hair shiney and is said to slow hair from turning gray. Bladderwrack is rich in fucoidan which is said to have excellent anti-inflammatory effects and helps skin heal. Alginic acid conditions, smooths hair follicles and gives hair body. Burdock is said to stimulate hair follicles and improve blood circulation in the scalp. Rich in essential Fatty Acids, it is great for keeping hair from getting too dry. Ingredients: Yucca, Soapwort, Soap Nuts, Amla, Brahmi, Shikakai, , Burdock, Flax Seed, Horsetail, Ginger Root, Bladderwrack and Hibiscus. There are several ways this will work. 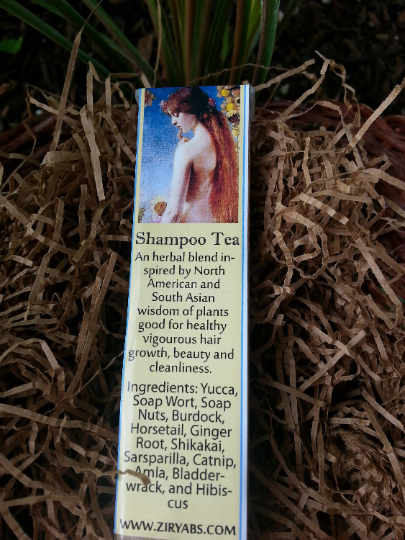 You can make a tea or use directly on your hair. To make a tea, you can use a cup of boiling water and a tablespoon of powder, allow to steep until cool. It is ready to be used. Pour tea over well wetted hair, work into scalp and hair. There won't be much in the way of suds, if any, but it really does clean hair. Rinse. Other ways to make tea is put a cup of warm water in a jar and a tablespoon of shampoo tea powder (more or less depending on hair length, shake vigorously and you can use it now (but it won't be as strong) or leave over night and use as above. It will last up to three days in the fridge. Another way you might want to try if you are a busy is just sprinkling the powder onto your wet hair, work in and rinse off. You can follow with a conditioner and/or rinse with a cup of distilled water and ACV mix. The ACV ratio to water should be no more than 10% ACV. 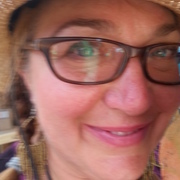 I buy a gallon of distilled water, pour 1/2 a cup of ACV into the gallon, store under my bathroom sink and after I've washed my hair pour about a cup of ACV/Water mix over my hair. It softens my hair nicely, rinsing away any minerals from the water. Especially good when you have hard water. The ACV smooths the hair cuticles and leaves your hair at a nice Ph.